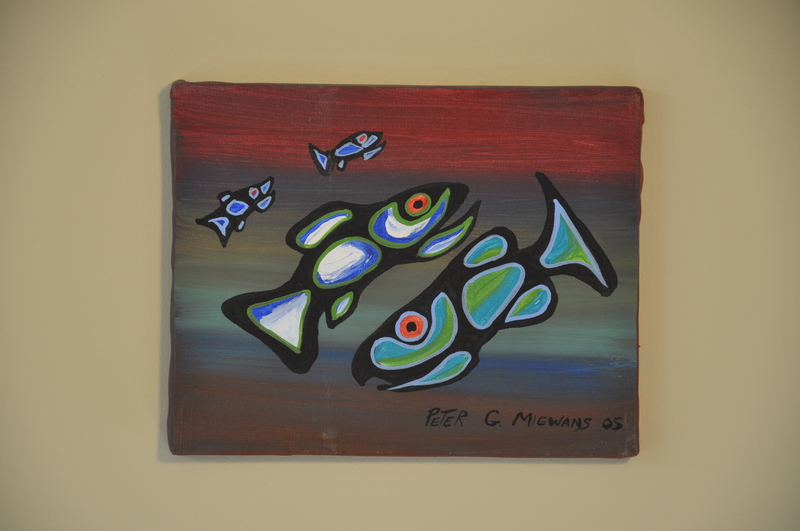 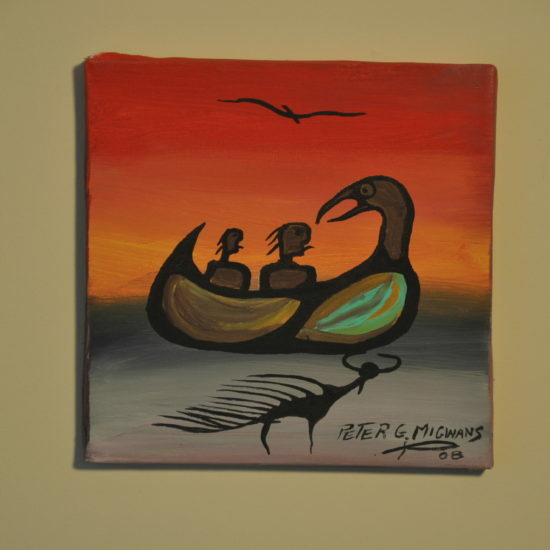 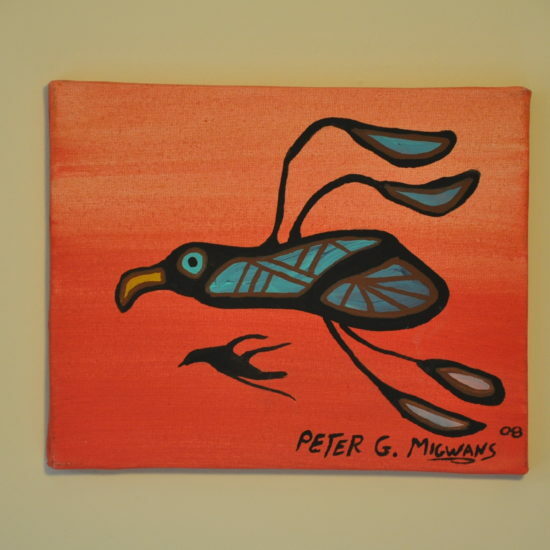 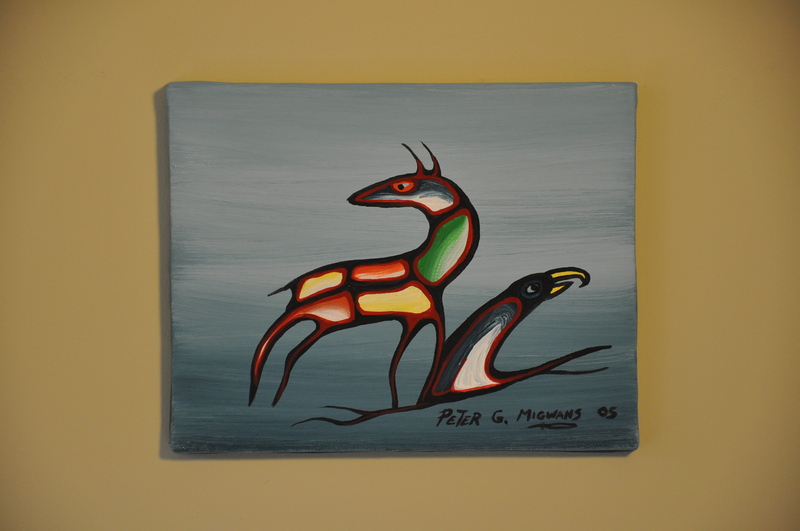 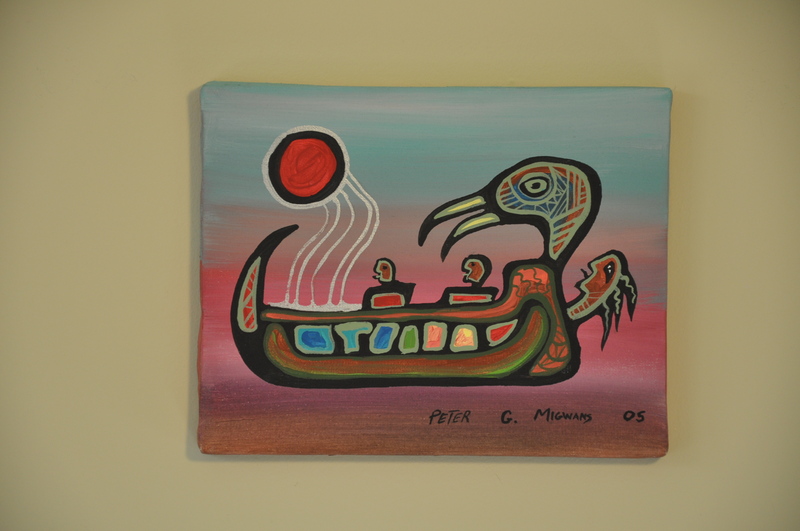 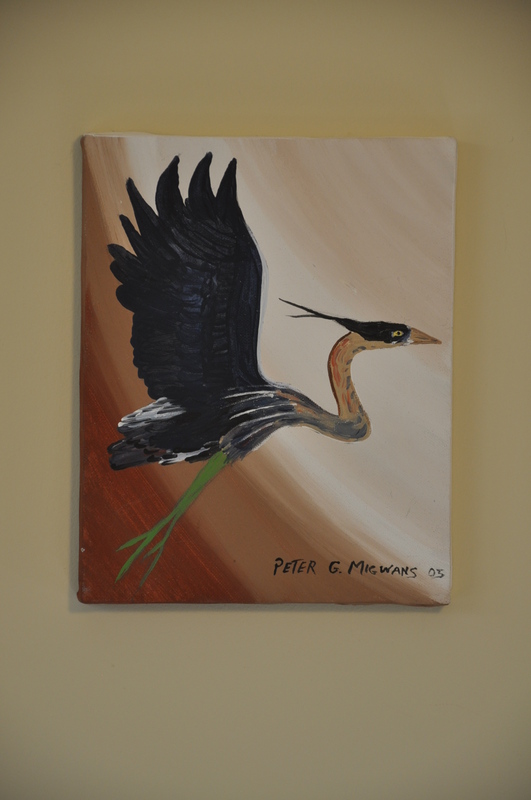 Peter G. Migwans was born in West Bay, Manitoulin Island in 1938. 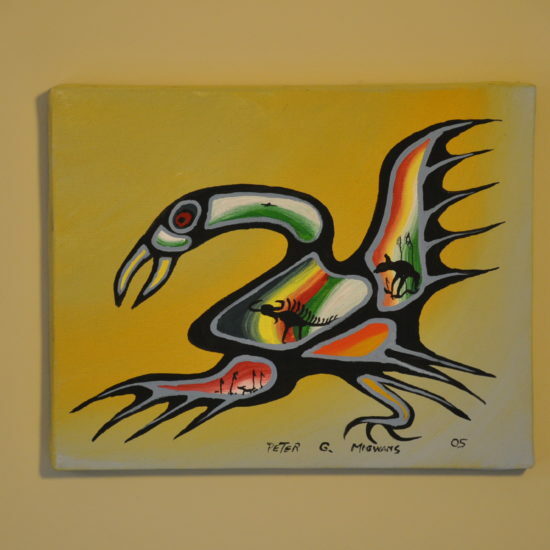 His childhood was spent in this First Nation community where his father Dominic, was Chief. 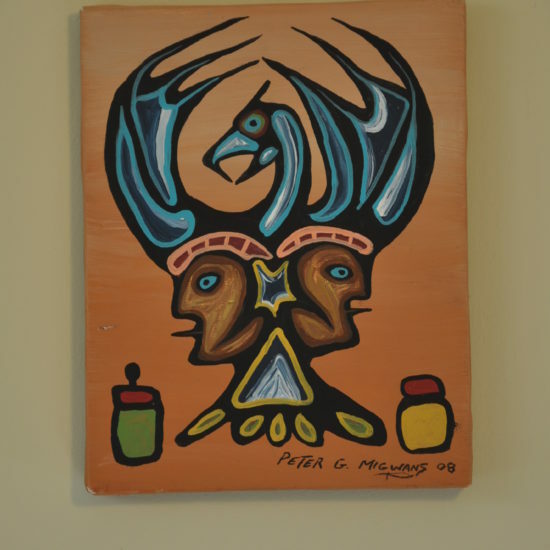 Surrounded by family and elders he listened to their teachings and stories of the past As Peter matured he felt impelled to preserve the heritage of his people. 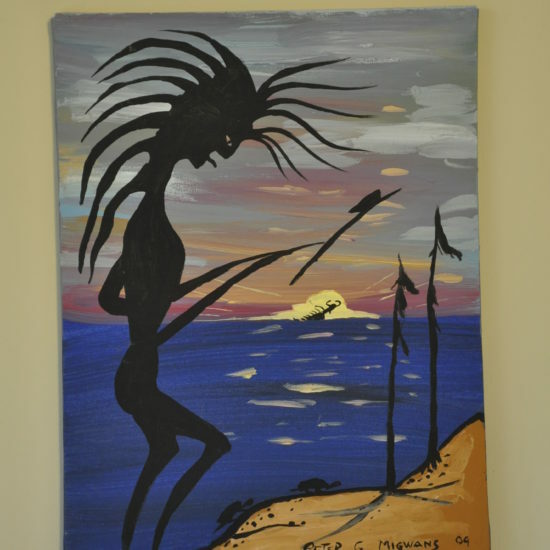 He chose to paint in the Woodland tradition. 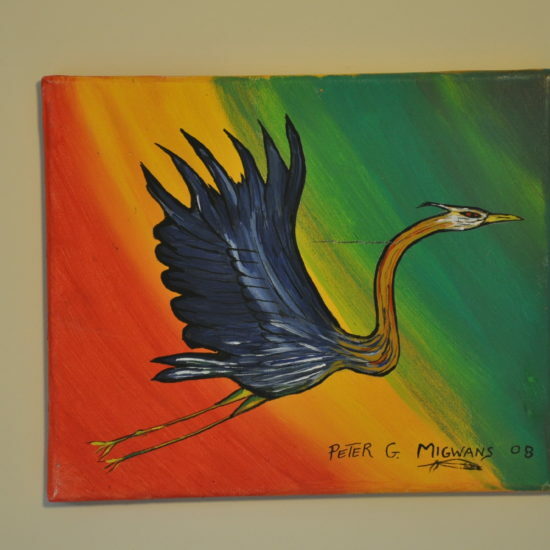 Migwans made the choice early, when still attending grade school, Peter daydreamed and drew instead of attending to his school lessons. 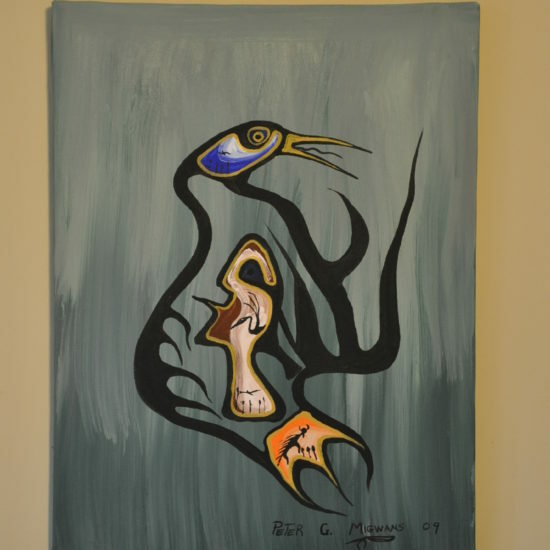 He has attended art courses but is essentially self-taught He works best when surround,~d by his family and the sounds of an active household, children’s voices and music. 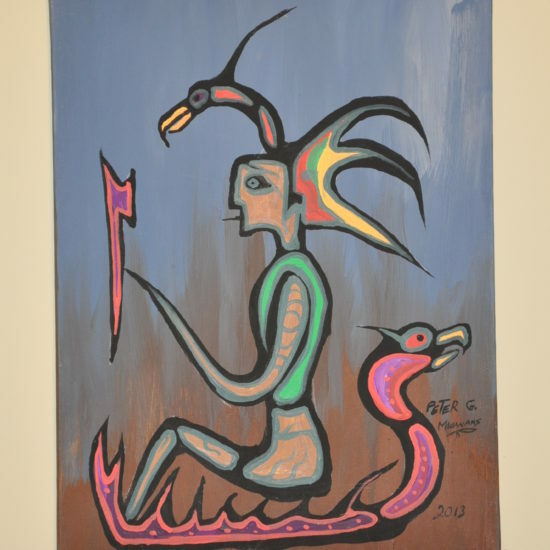 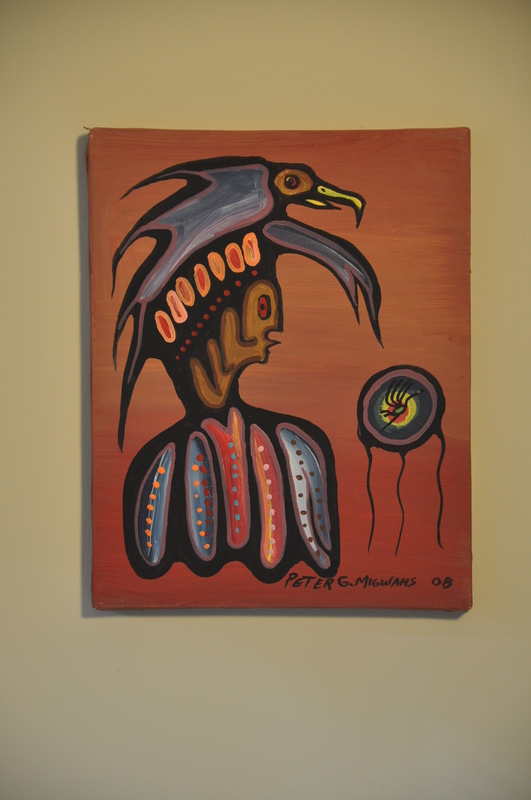 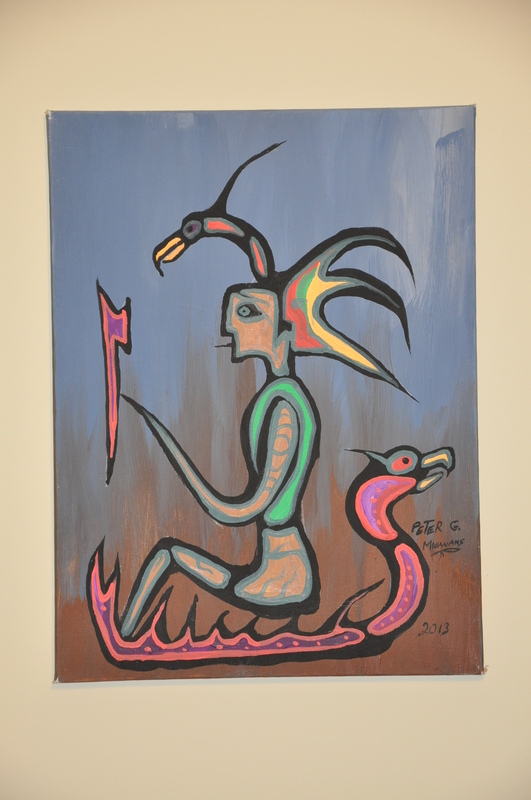 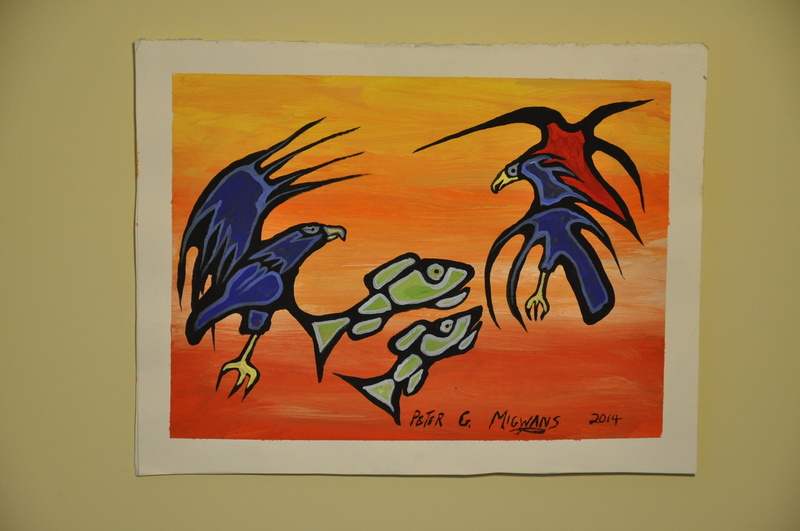 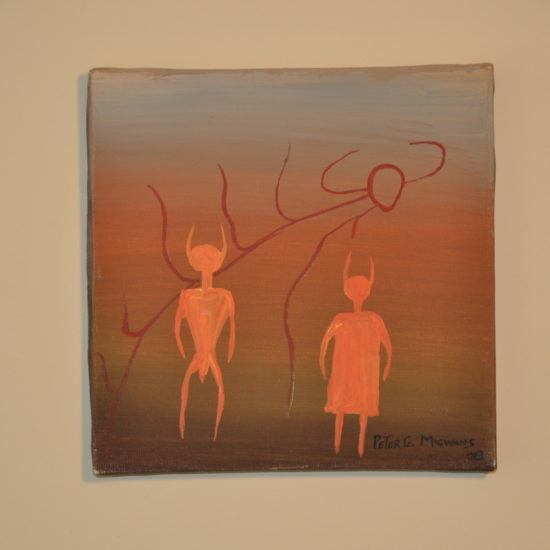 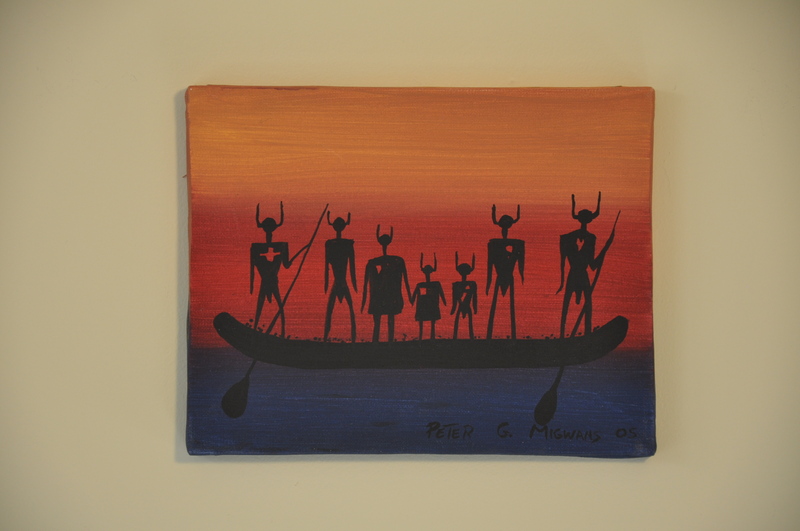 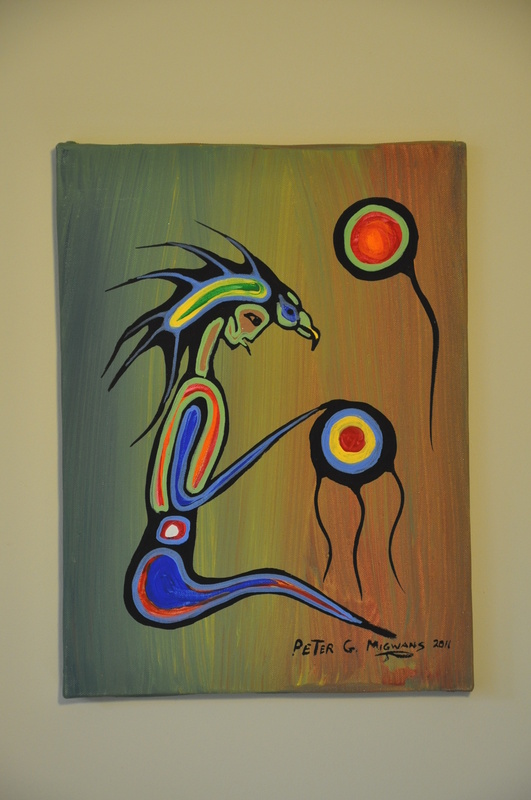 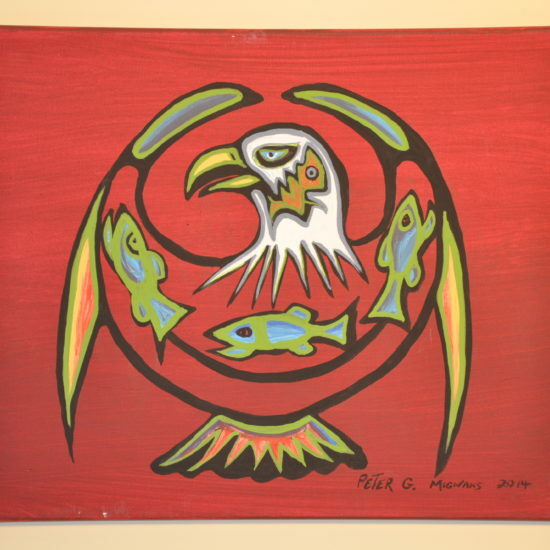 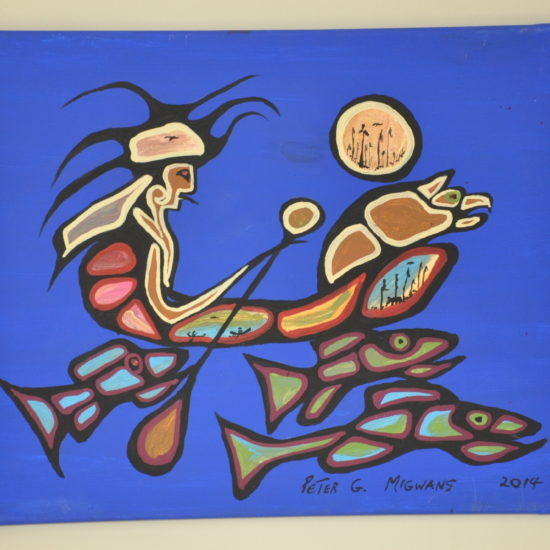 Through Peter’s canvases the world has a window into the North American Native tradition and spirituality. 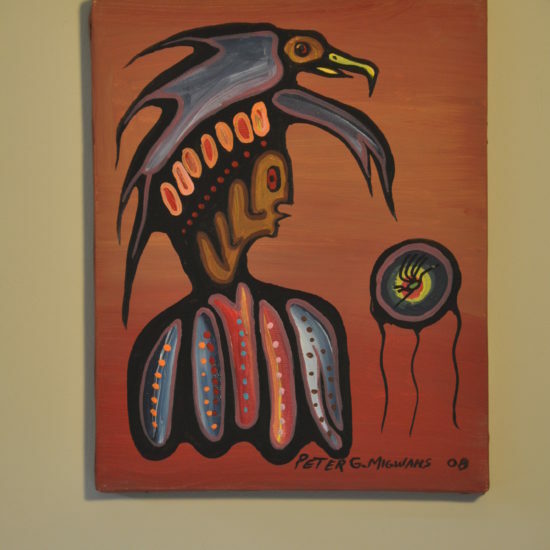 Although Peter adheres to many of the image making tradition ofWoodland painting, he has added his own unique style and vision. 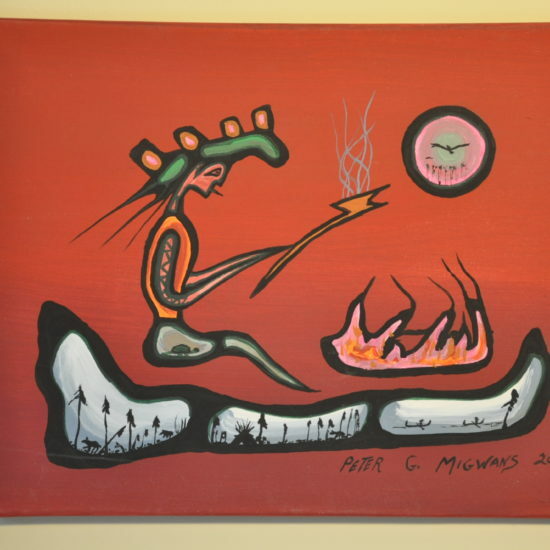 That individuality can be seen especially in the manner in which he flouts traditional figurative and landscape elements across ethereal backgrounds, suggesting infinite and indefinite space and pervasive light. 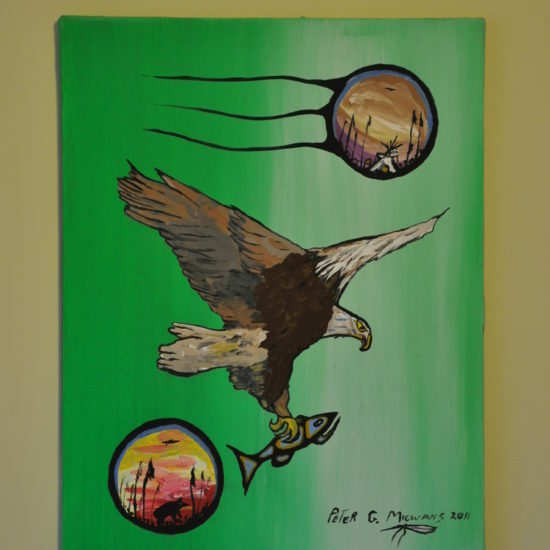 This also gives him the opportunity to stretch beyond the confines of flat areas of colour to weave a variety of lyrical colours and vibrant brush strokes onto the canvas. 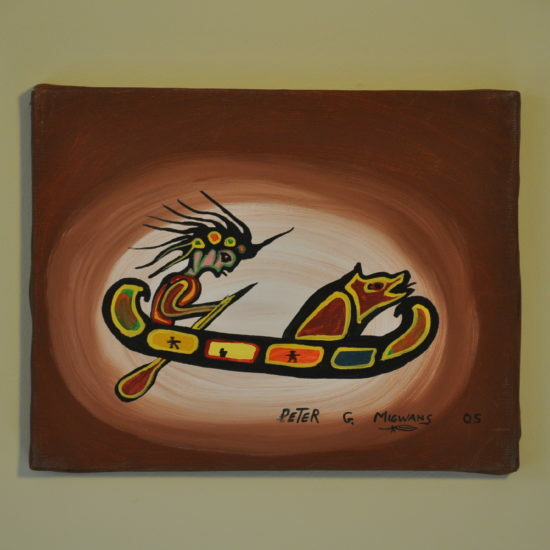 The past twenty years Peter has been working to advance the exposure of North American Native Art. 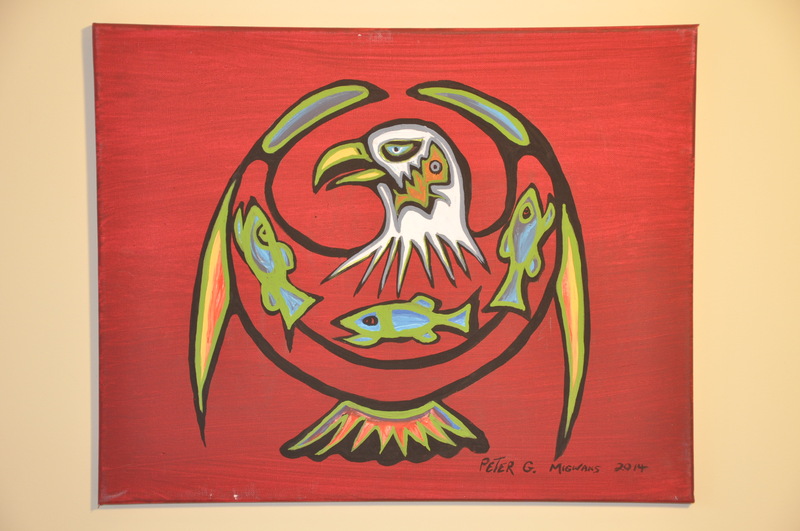 Together with fellow Native artists he participated in annual Christmas art shows though the 1980’s. 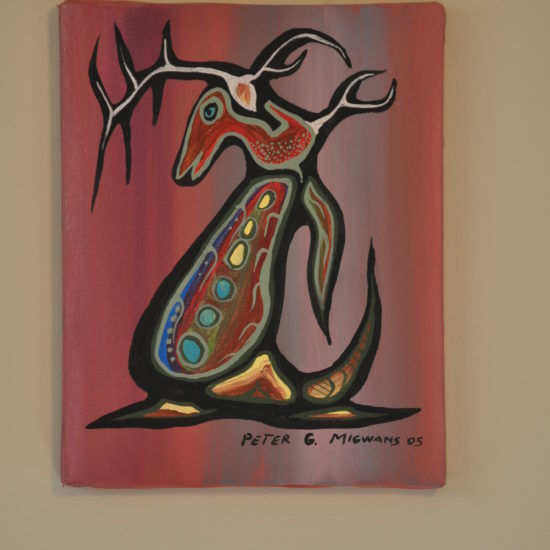 Presently with a new group of 5 Native artists, including Migwans son Richard, Peter has taken part in many area art shows. 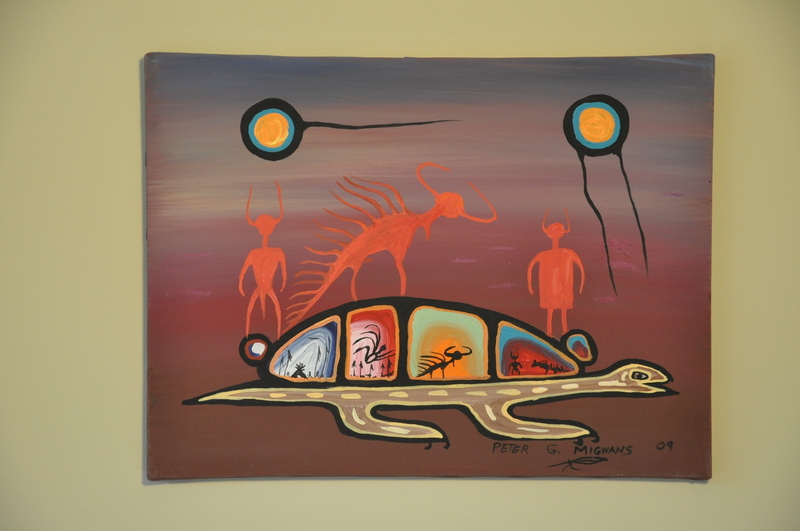 In addition his work in on display at the Royal Ontario Museum, The Ojibwa Cultural Foundation. 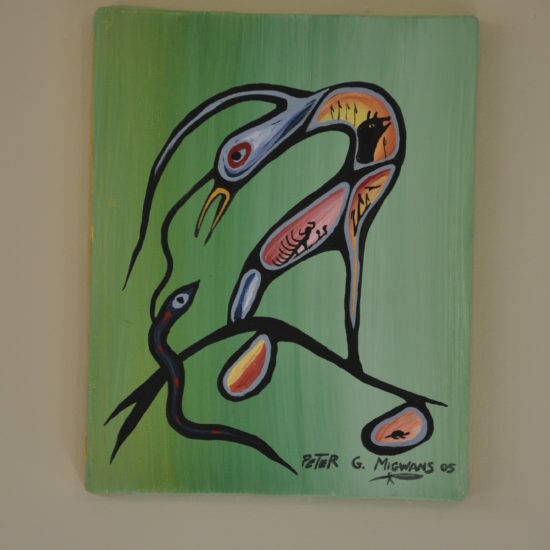 Gallery Gauthier in Sudbury. 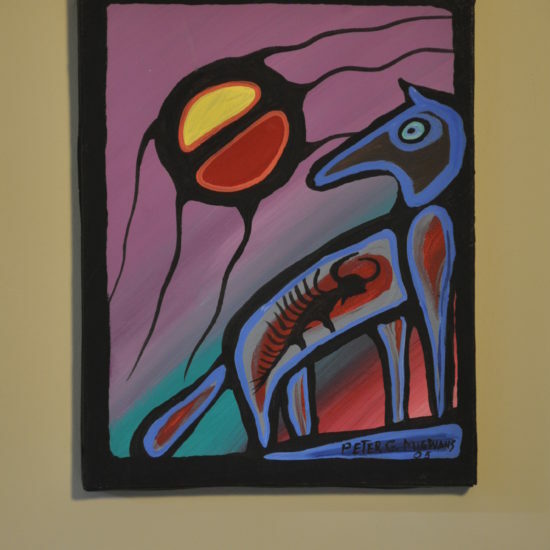 the CobbleStone Gallery in Niagara-on-the-Lake, the Art Gallery of Algoma in Sault Ste. 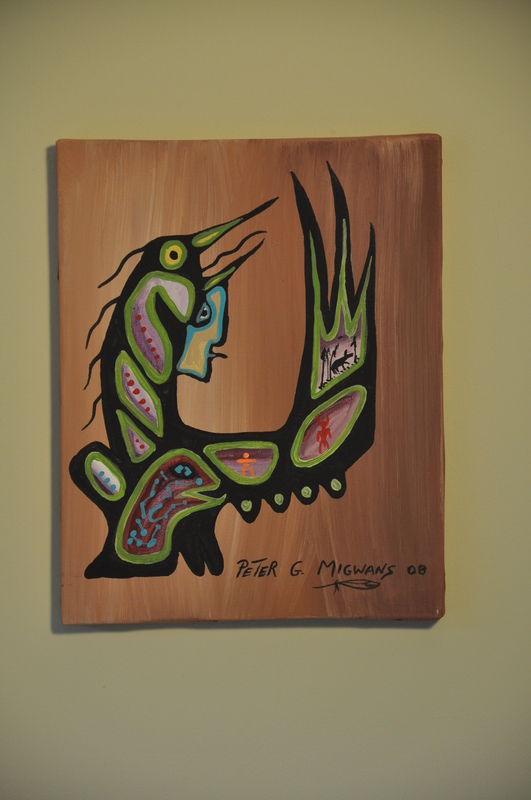 Marie, as well as McGinnies & Nixon Gallery in Mississauga. 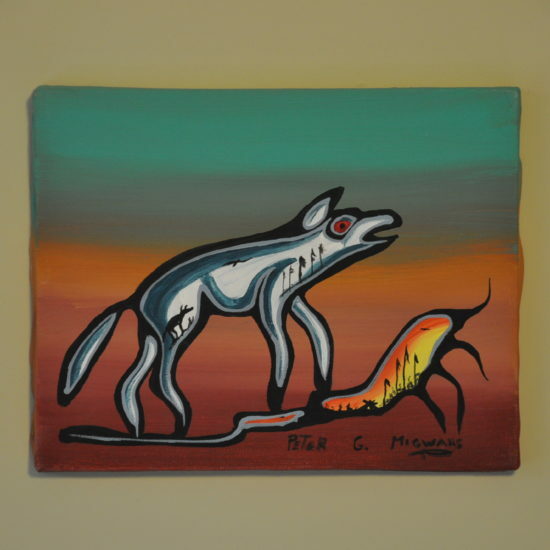 Migwans also has private collections in Michigan, Ontario and Manitoba. 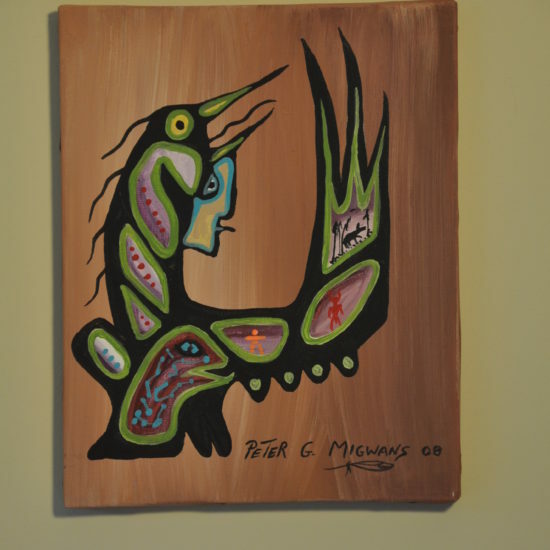 Peter has also made and sold totem poles. 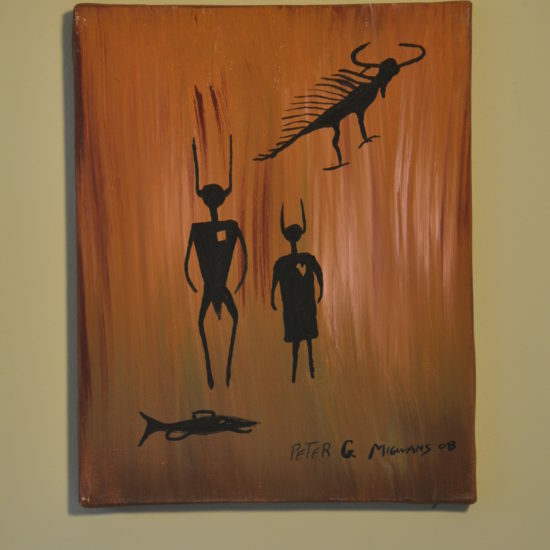 There is a practical balance in Peter’s life – his working career – 30 years in the steel mills of Sault Ste Marie. 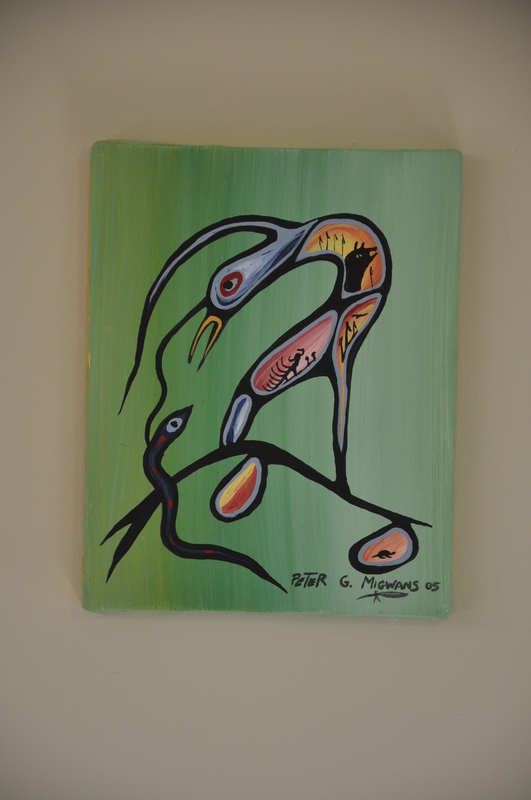 He has grown to be comfortable in both environments. 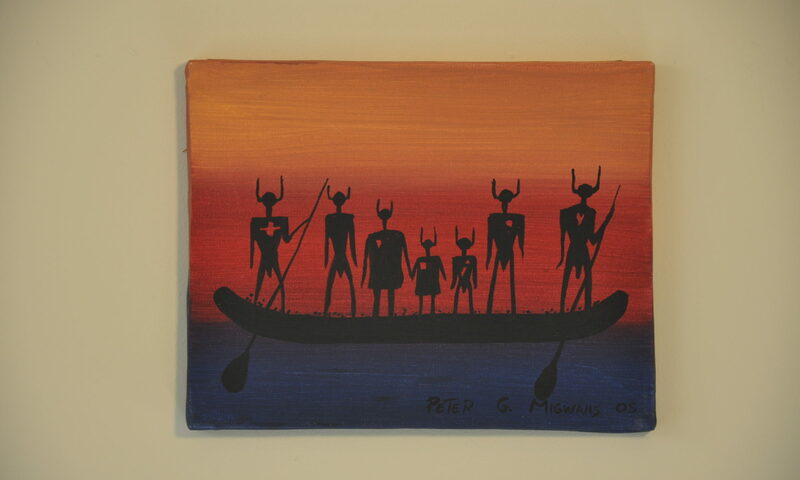 As Peter explains, ”Odawas traditionally were traders … Immigrating, meeting other Nations and living beyond the confines of home”. 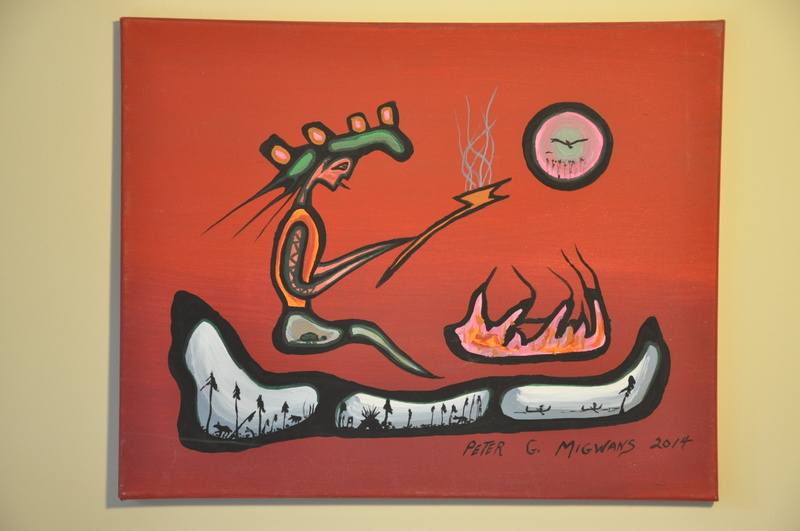 When Migwans talks about the past, present and future of the North American native people he does not dwell on the injustice that the white man’s rule has imposed. 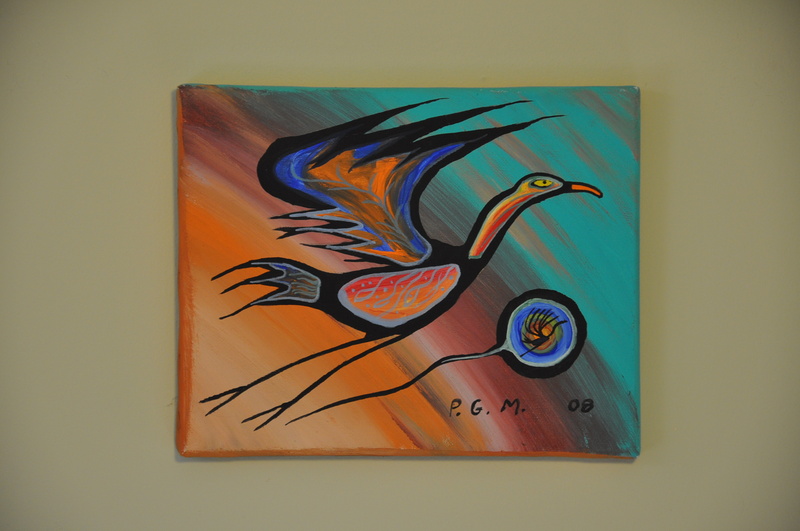 His teaching is positive of the native culture. 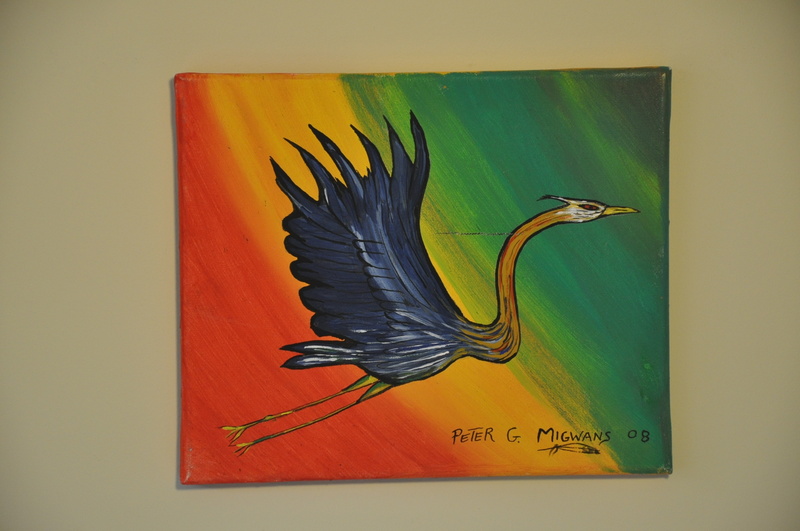 Peter is much sought after as a speaker at area universities, colleges, secondary and elementary schools. 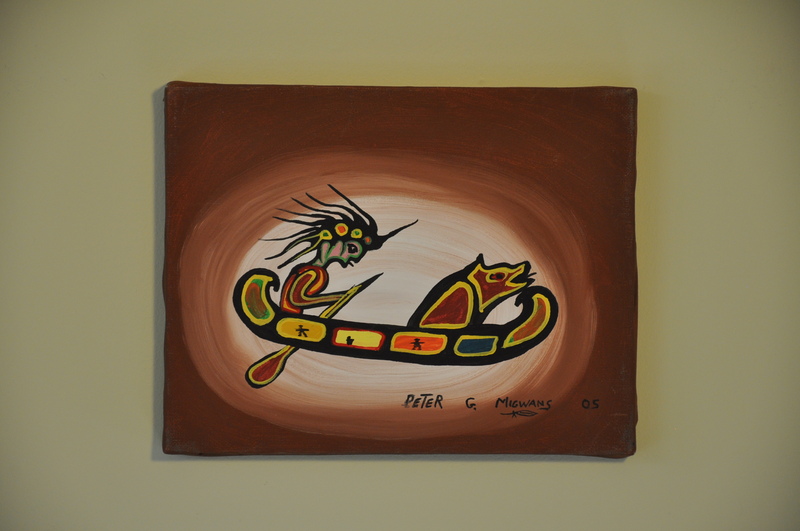 He is often the keynote speaker or Elder at First Nations workshops. 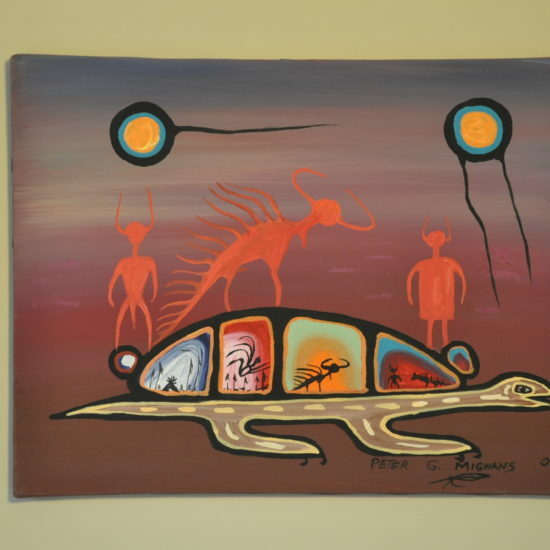 He participates in healing circles, visits area correctional institutions, and recently visited the Hugh McMillan Centre for disabled children in Toronto. 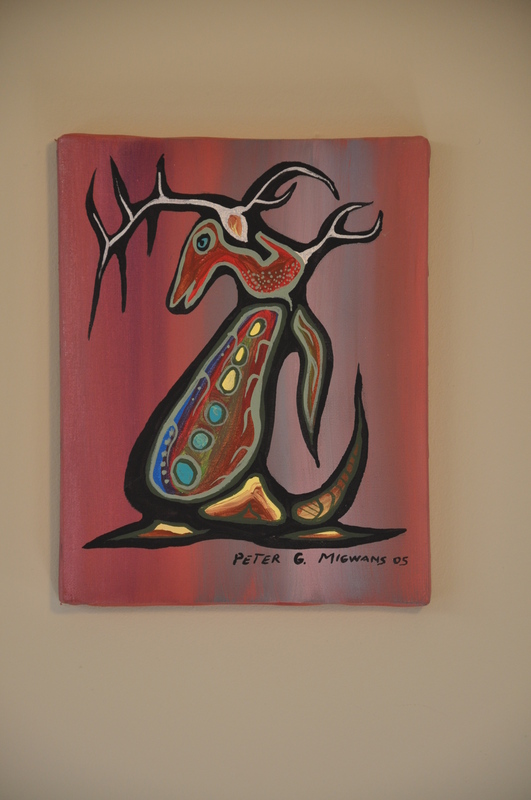 Peter is acknowledged by his community as an Elder; a spokesperson and spiritual advisor. 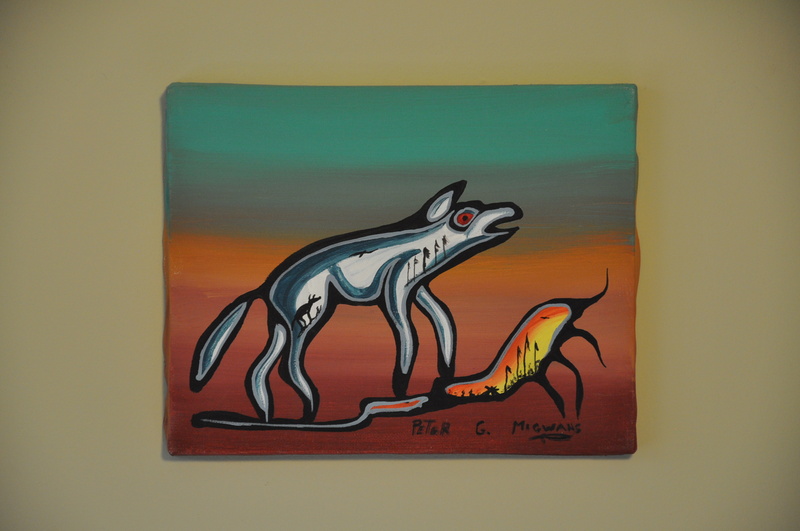 He is chairperson of the Sault Ste. 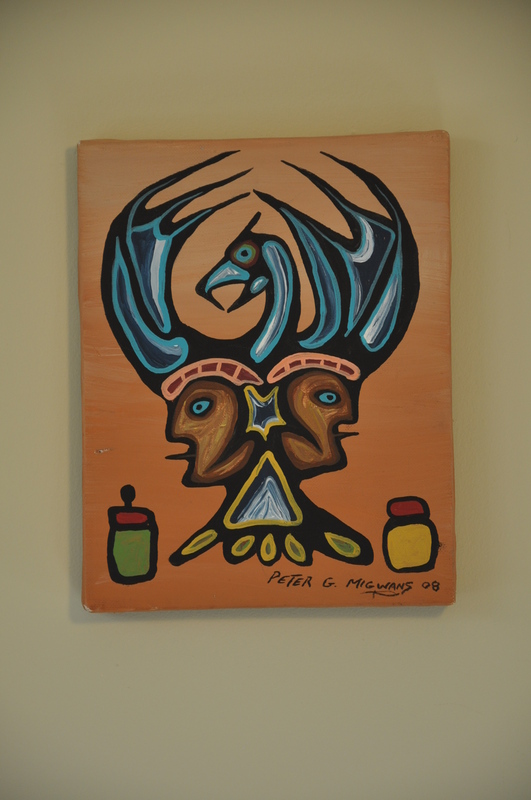 Marie Indian Friendship Centre and a founding member of Neechkewehn Homes. 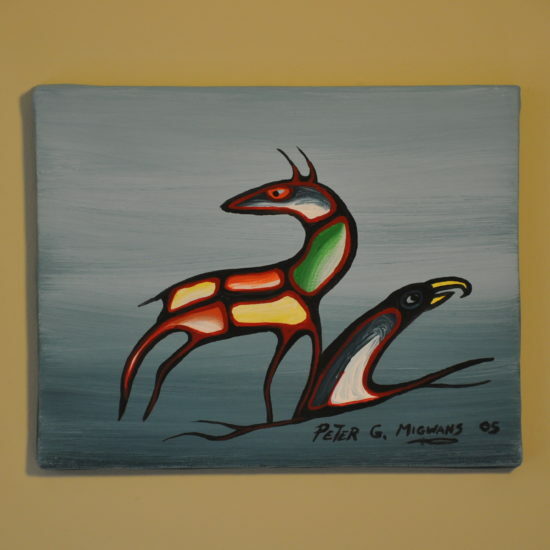 In 1993 his leadership was recognized by the Canadian Government with the presentation of a Canada 125 Medal. 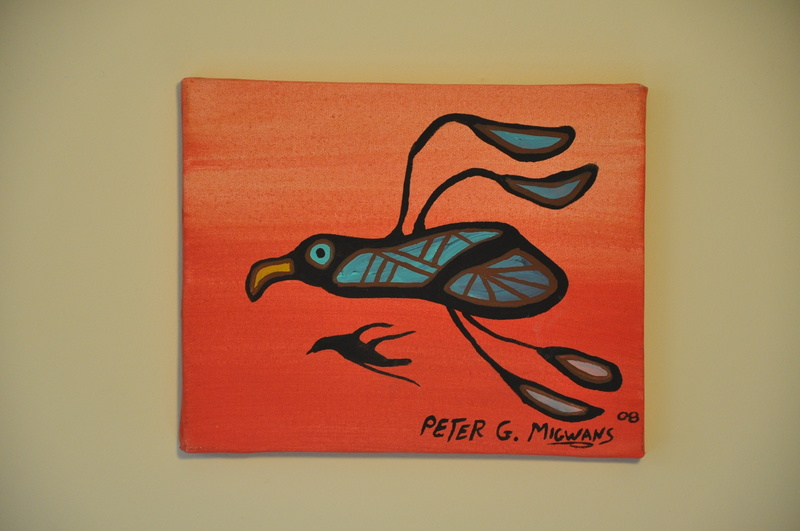 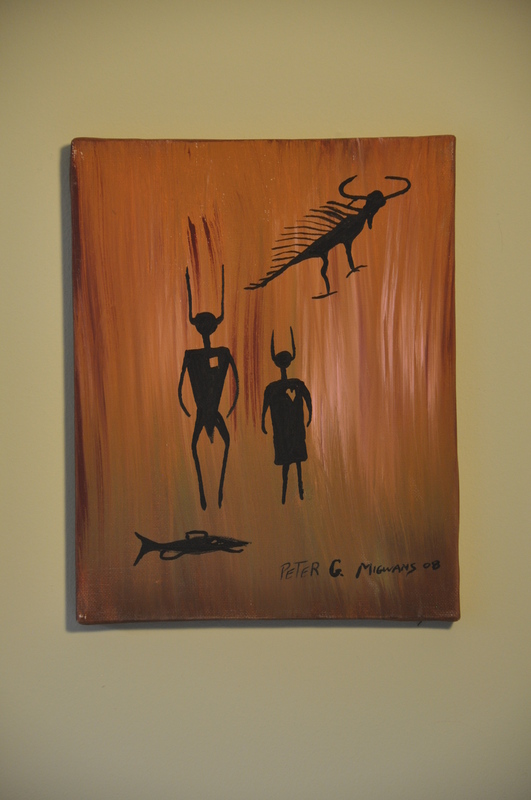 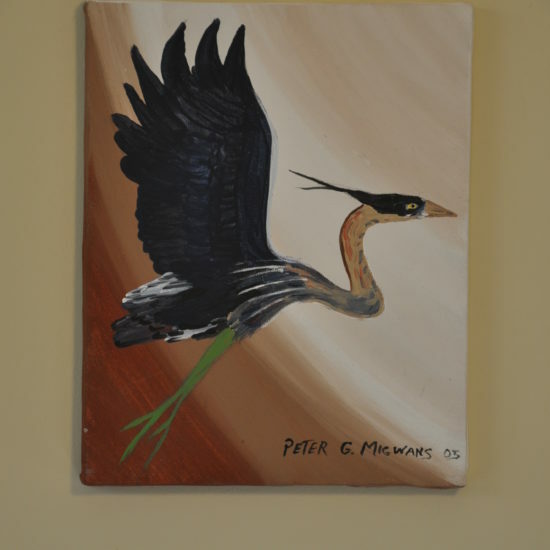 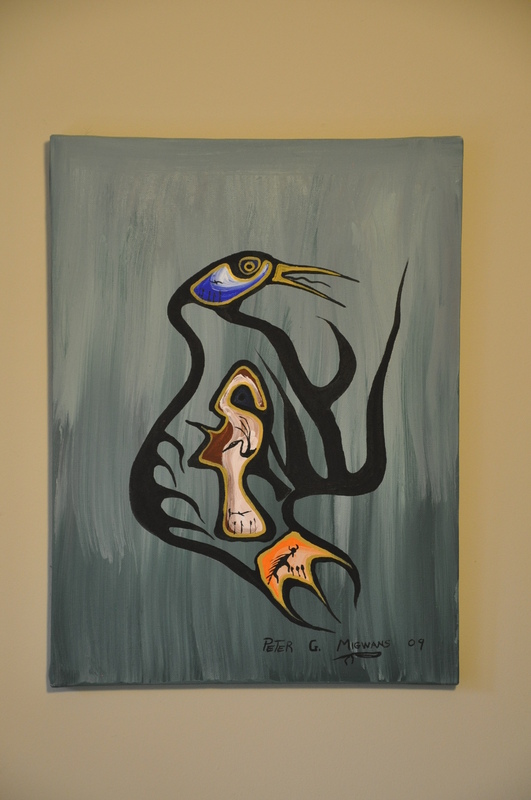 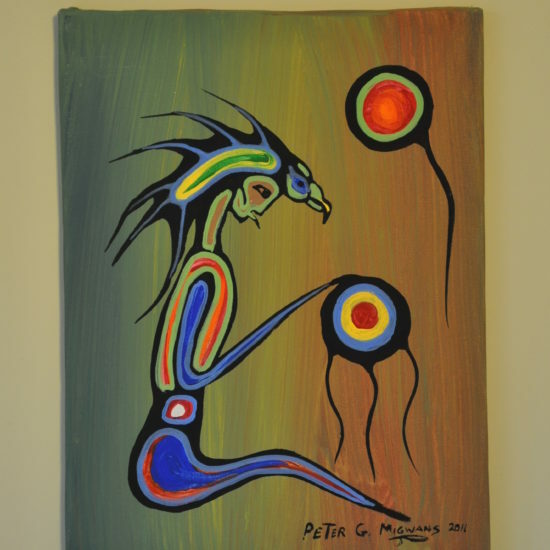 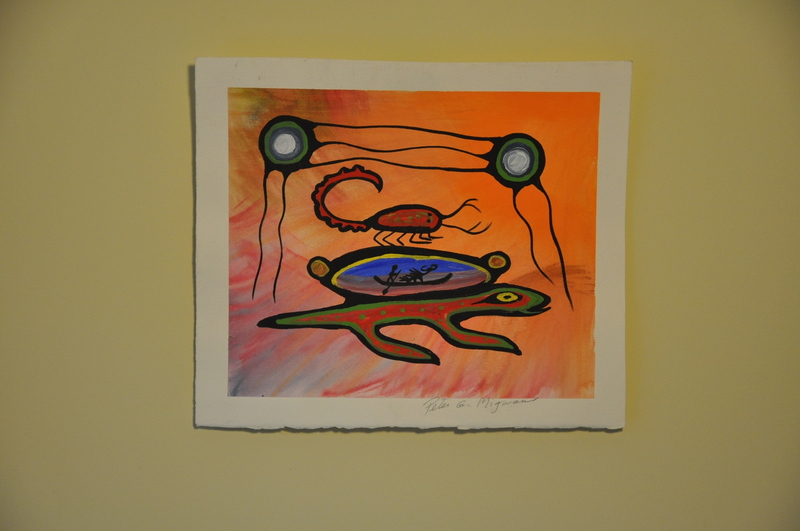 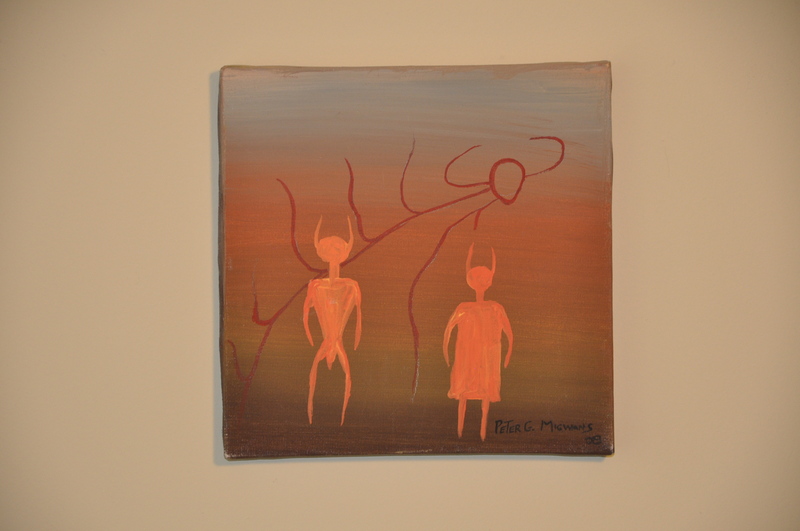 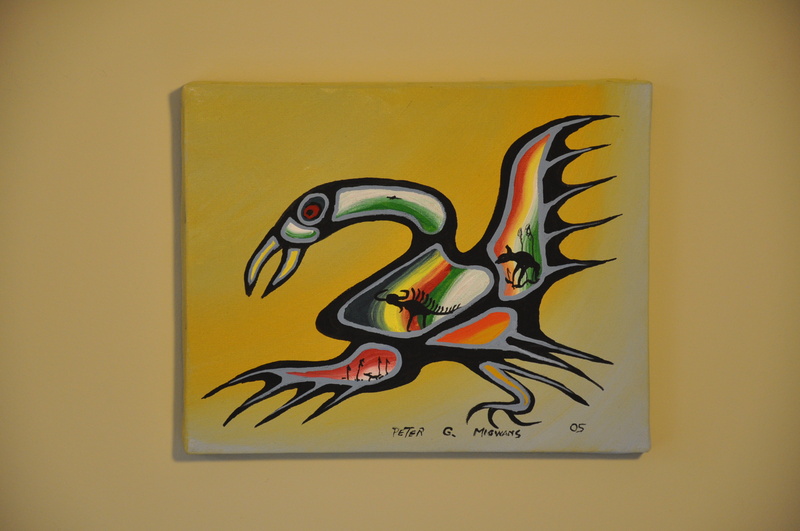 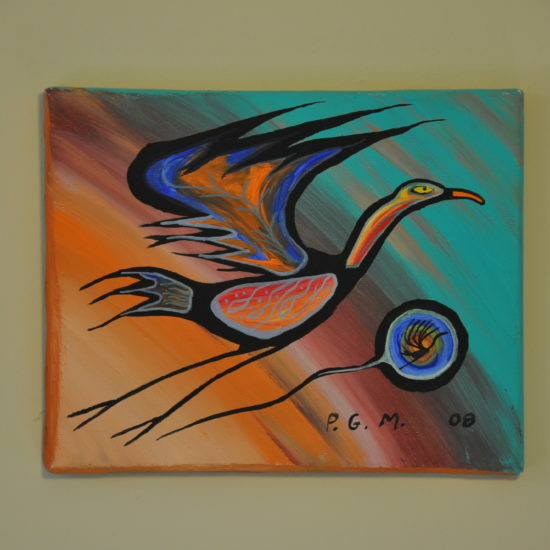 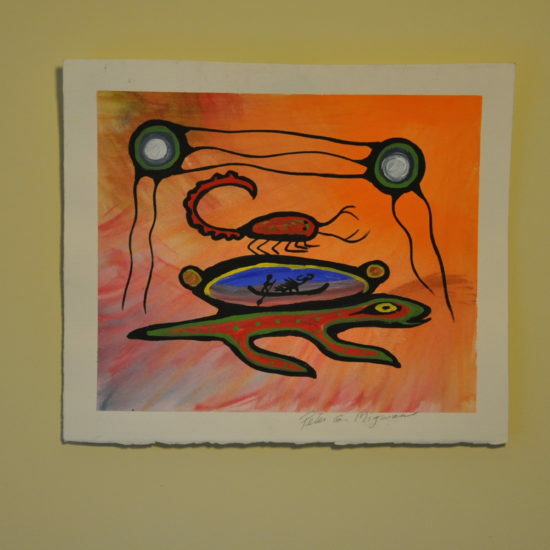 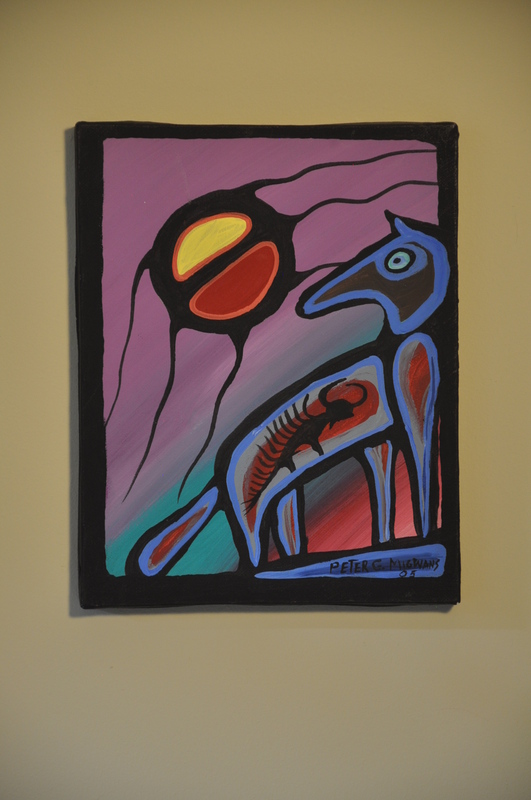 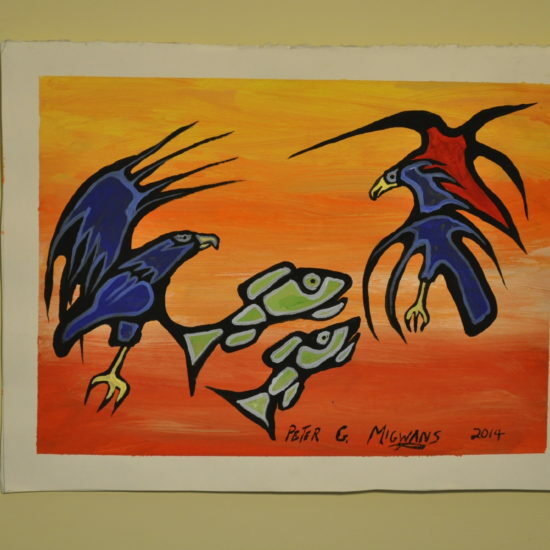 Today Peter’s art has grown beyond the recording of Native histories. 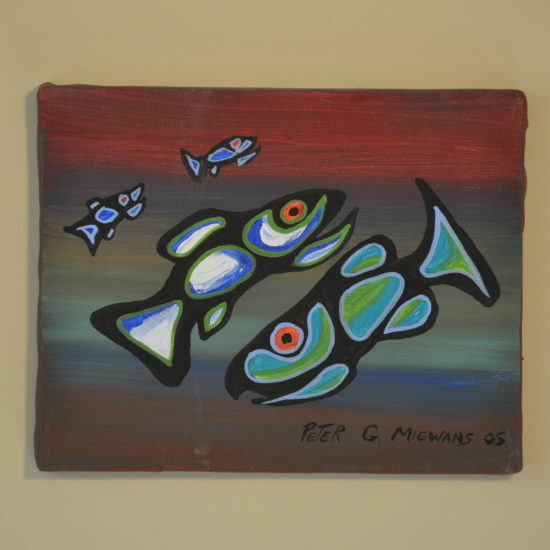 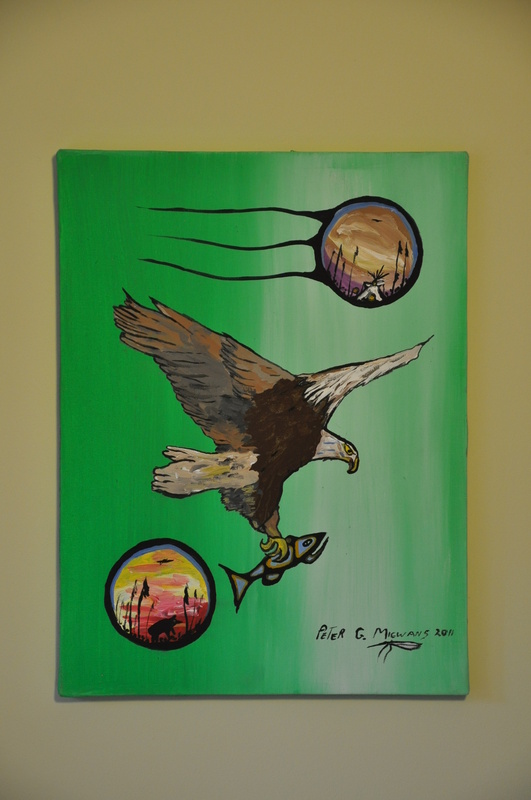 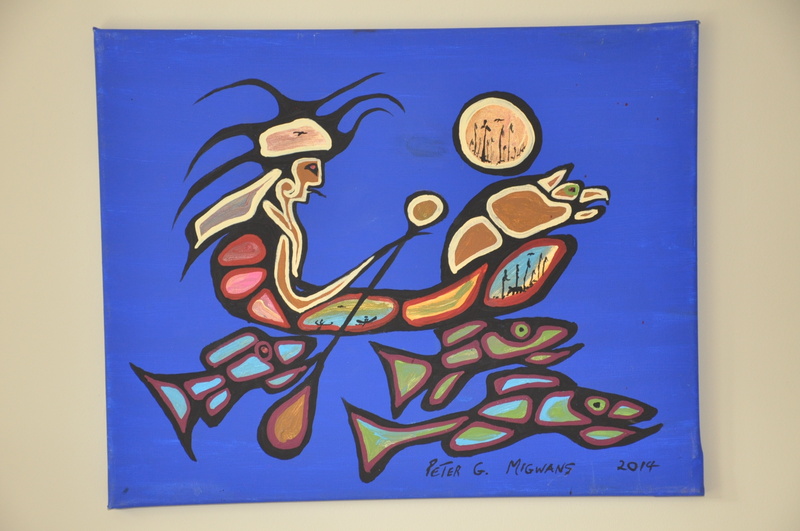 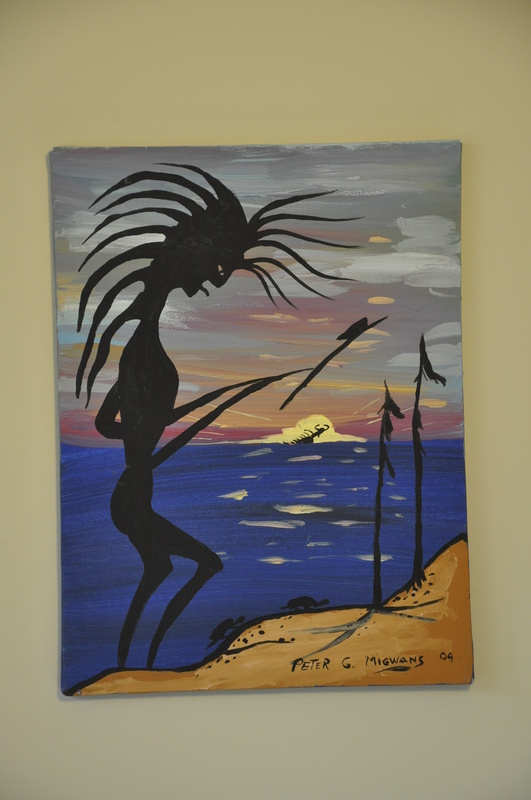 Migwans has worked with Terry Fox’s parents, as well as send a painting to the Pope in Rome. 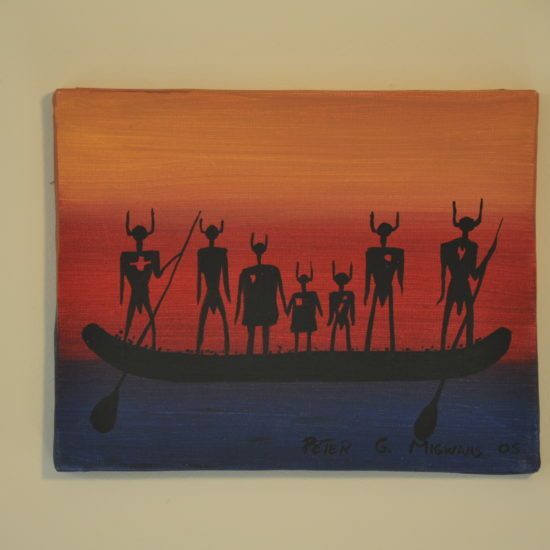 His paintings have become the backdrop to a new artistic dimension … Storytelling. 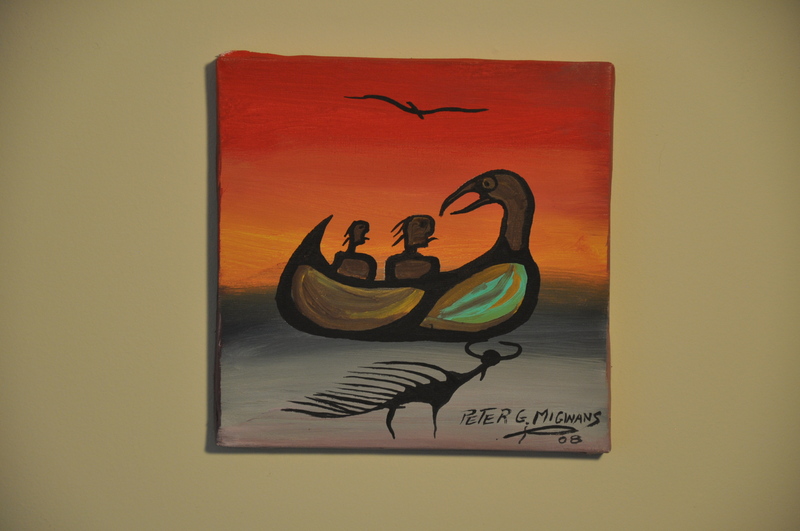 Each canvas brings forth stories, some new, some old. 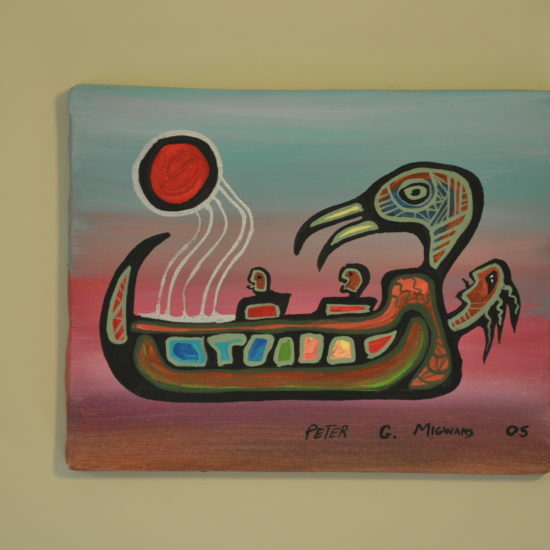 Peter is the Sault area contact for Storytellers of Canada. 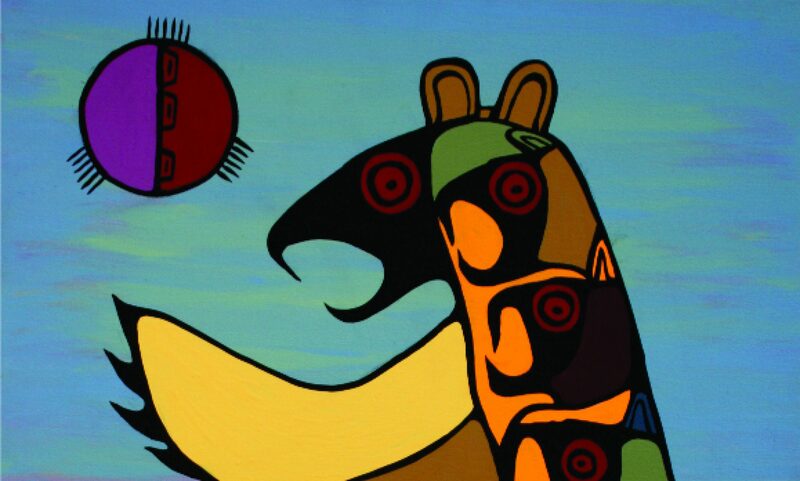 He has participated in workshop5 and performances from Whitehorse, Yukon Territories, Edmonton, Halifax to Oshawa.